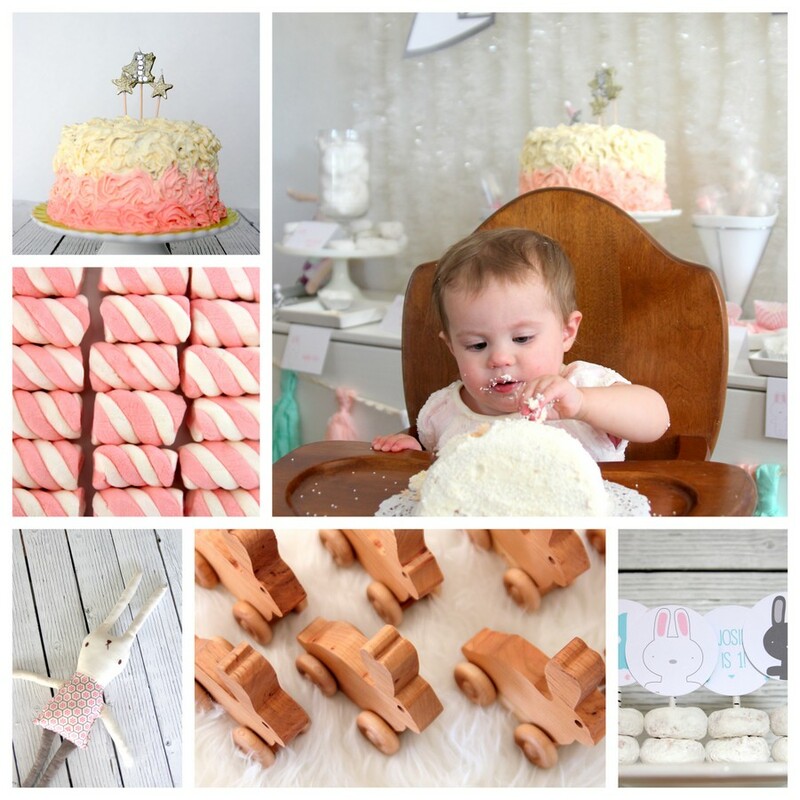 If you follow kojo on instagram, you’ve seen all sorts of sneak peaks of bunny making and my niece’s Snow Bunny first birthday party- today I’m going to share all of the cozy, snow bunny-ish details. Little Miss Josie lives here in Denver and it has been so fun to get to know her this year… in fact, I take care of her on Mondays and seriously can’t imagine our weeks without her! She is hilarious, sweet, determined, and the cutest little show-off (she’s been walking and talking for months already!). 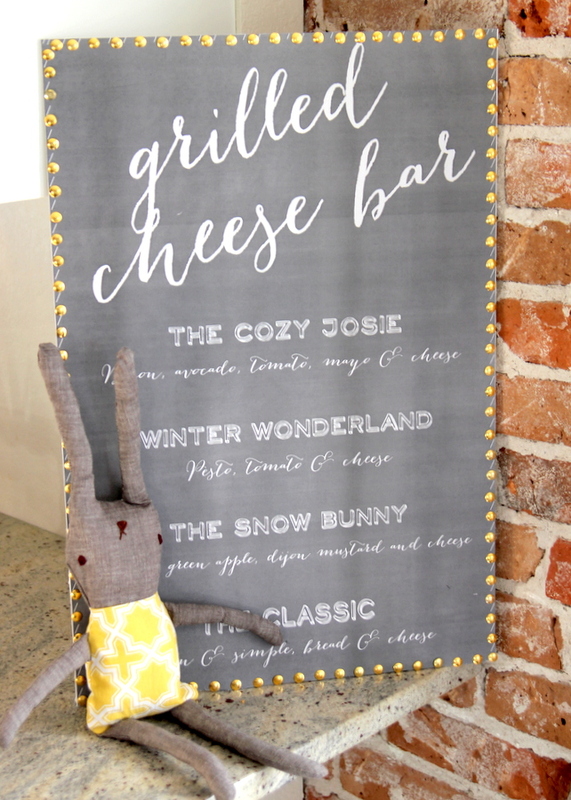 Josie’s two great loves (besides Burke and Pi) are her stuffed bunny rabbit and grilled cheese, so a cozy Snow Bunny party complete with a grilled cheese bar and a hot cocoa station was the perfect way to celebrate her first birthday! Josie’s mama, my sister-in-law and sweet friend, helped me pull together the details for this party- it turned out even better than I expected. As I mentioned, Miss Josie loves grilled cheese with her whole heart, so lunch was a Grilled Cheese Bar with homemade tomato soup and bunny shaped macaroni and cheese. Trish made a list of gourmet grilled cheese recipes for people to try out and we made those ideas into a menu board (my favorite was the ‘Cozy Josie’). The perfect pair for a yummy grilled cheese sandwich (besides tomato soup, which was already covered) is a creamy cup of cocoa. 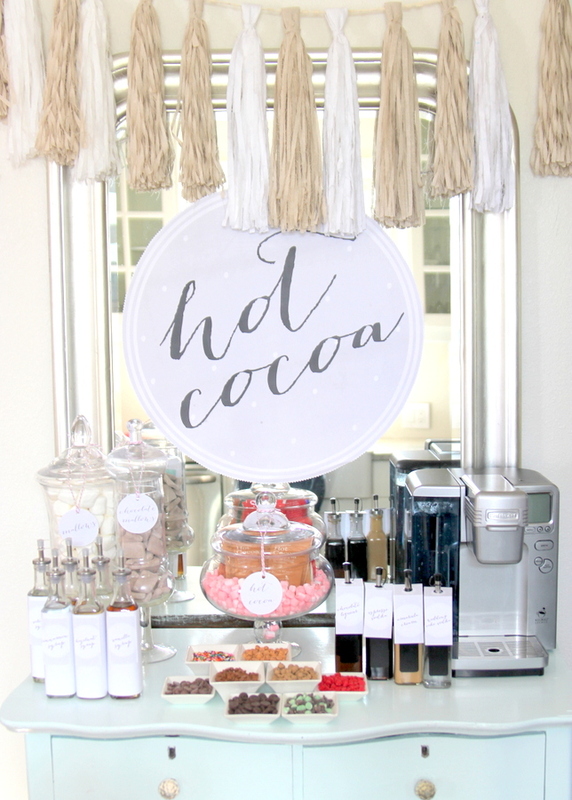 Thus, we added a Hot Cocoa Bar for that extra touch of coziness to this Snow Bunny Party (more details to come on this one…). 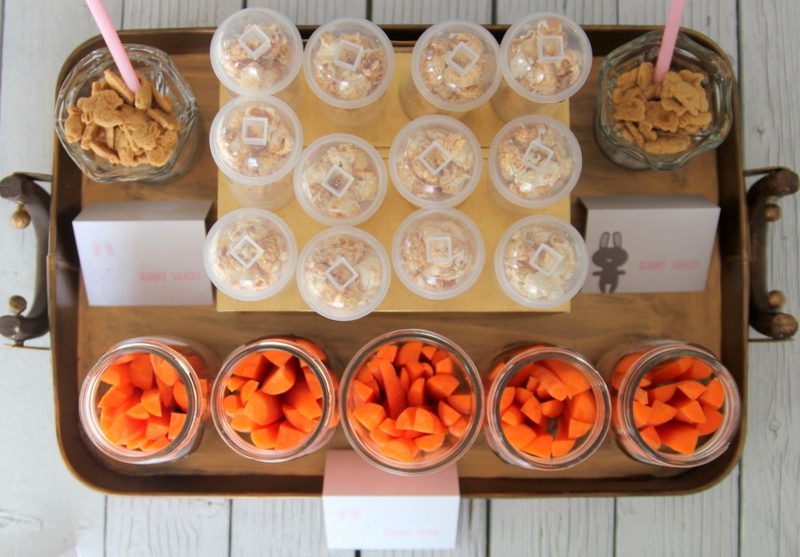 A “Rabbit Food” snack station included little munchies to accompany the grilled cheese bar- popcorn, matchstick carrots and bunny shaped crackers all made for good lunch add-ons. 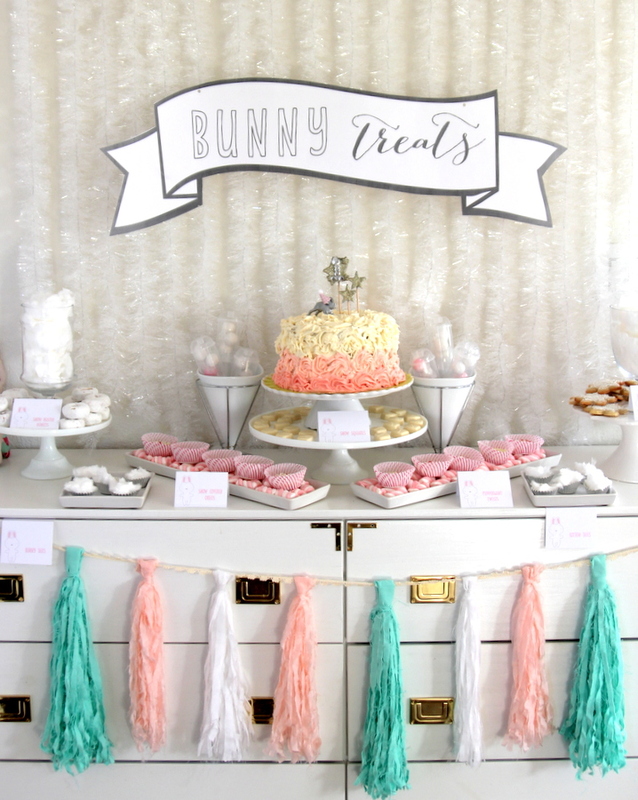 The treat table included an oh-so-yummy (and pretty) cake, cotton candy ‘snow,’ white gum balls in push pop containers (mostly eaten by Burke and Piper Jane- haha! 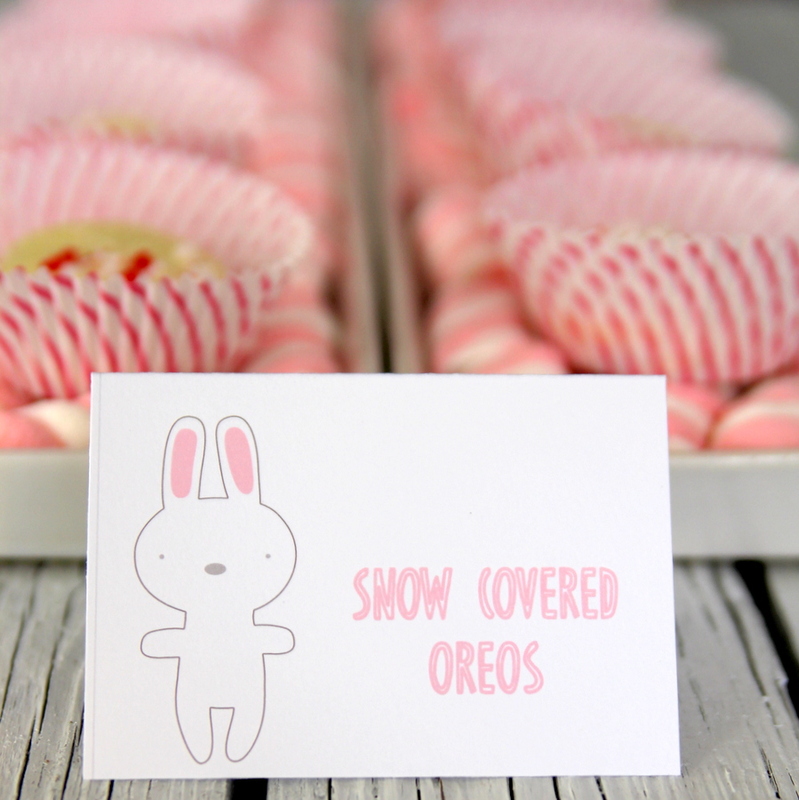 ), pink and white swirled marshmallows, ‘snow dusted’ donuts, snowflake shaped sugar cookies and ‘snow covered Oreos,’ and grapefruit flavored Izzes with sweet bunny wraps. There was even a sweet little bunny smash cake for Miss Josie (one of Trish’s good friends makes cakes and she kindly made both the treat table cake and the smash cake for us). 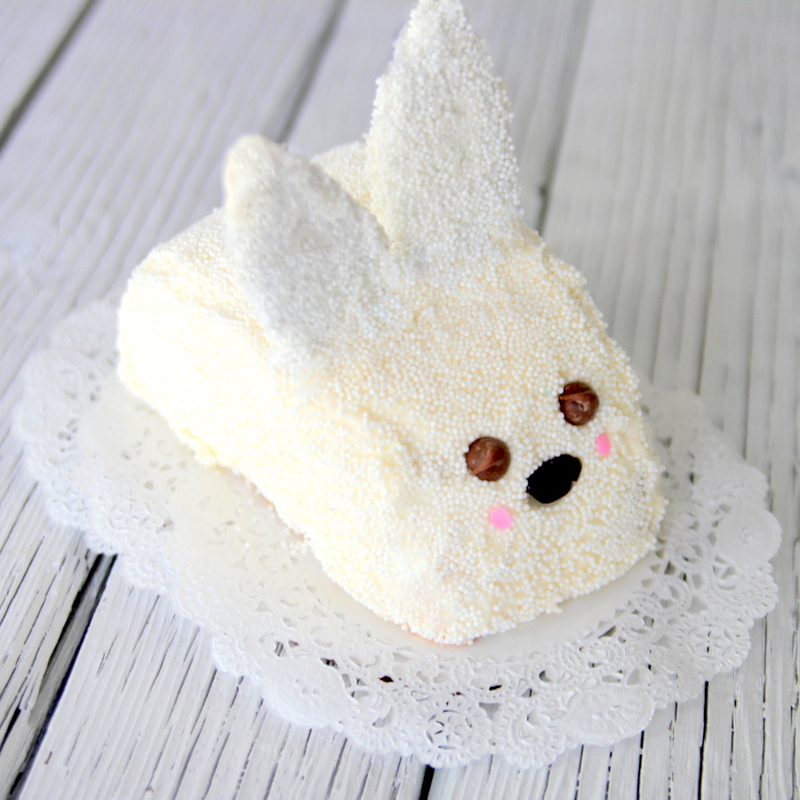 Funny story- once the guests figured out the the white fluffiness was cotton candy (not cotton balls as suspected), it was the absolute hit of the treat table. Who would’ve guessed? 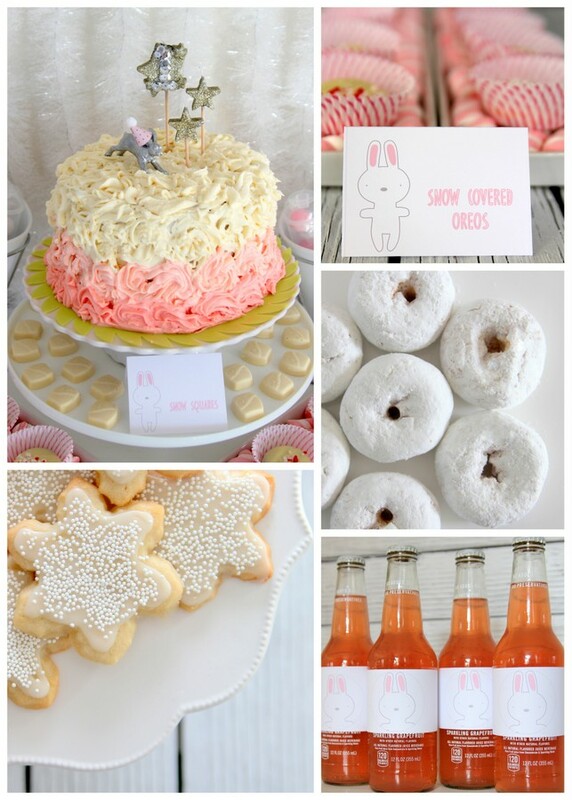 The mostly white color palette, with bits of mint and petal pink was a sweet backdrop for this snow bunny soiree. 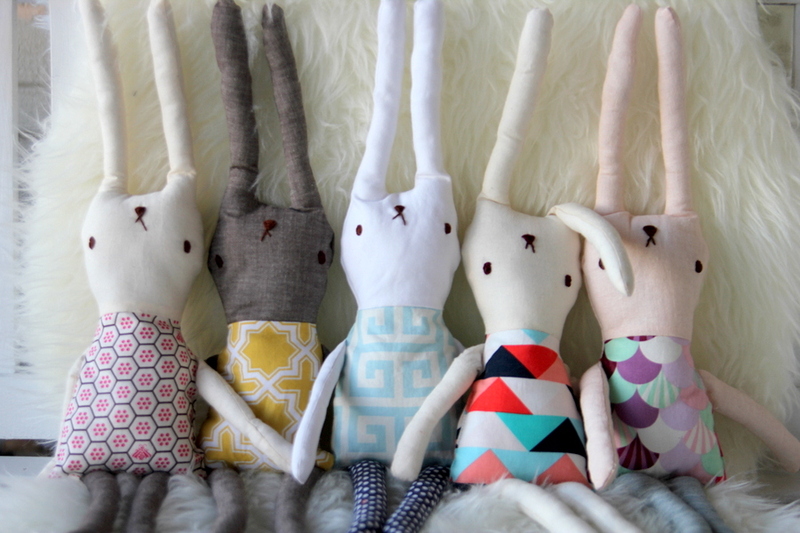 I even made a row of stuffed bunnies to punctuate the decor (Josie kept one as a birthday present!). 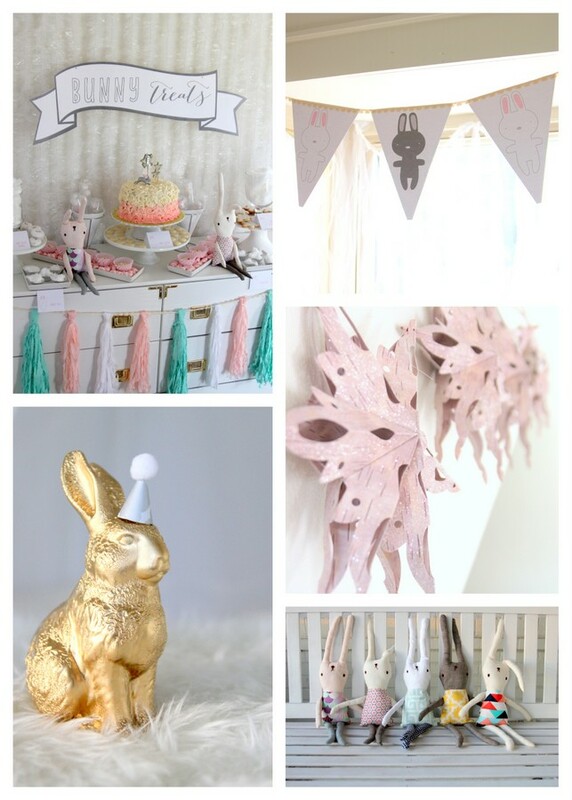 Jordan designed the bunny graphics- they are absolutely fabulous! 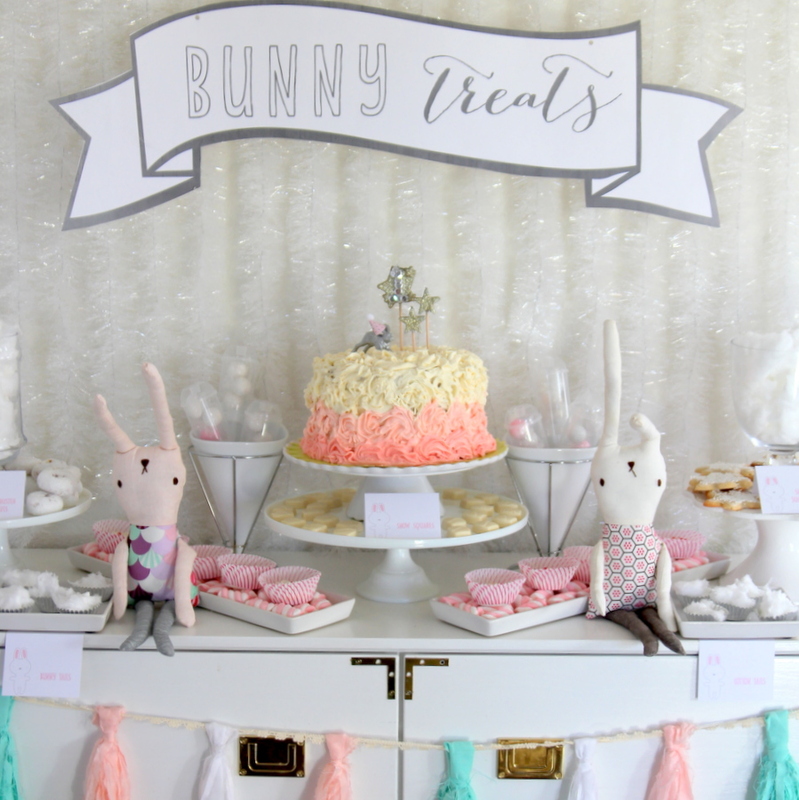 Little bunny signs and banners dotted the treat table and the snack table (and were sprinkled across the mantel, the front door and the windows as well). The theme for the rest of the decor was white, fluffy, and sparkly. Since my house already has a decent amount of white, metallic, and even a bunch of faux fur accessories, we ‘shopped the house’ for most of the decorations. 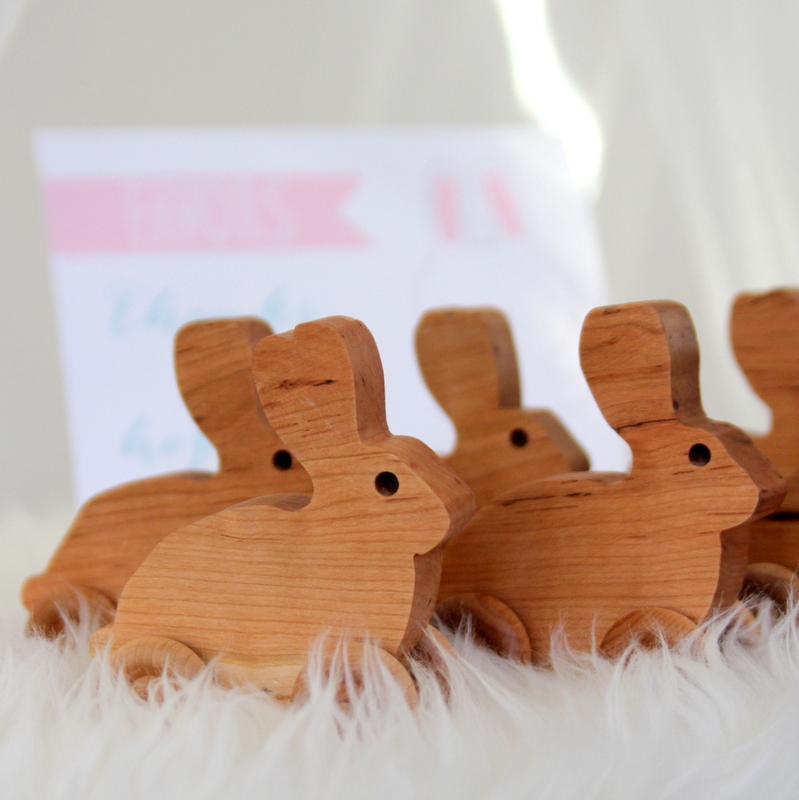 I can honestly say that I’ve never had a party with more sought after favors than these wooden rolling bunnies by SimpleGreat on etsy. Trish and I counted favors based on all of the families with kids, but guests without kids, single guests, my mother-in-law and of course the pint-sized guests were all fawning over the wooden bunnies. 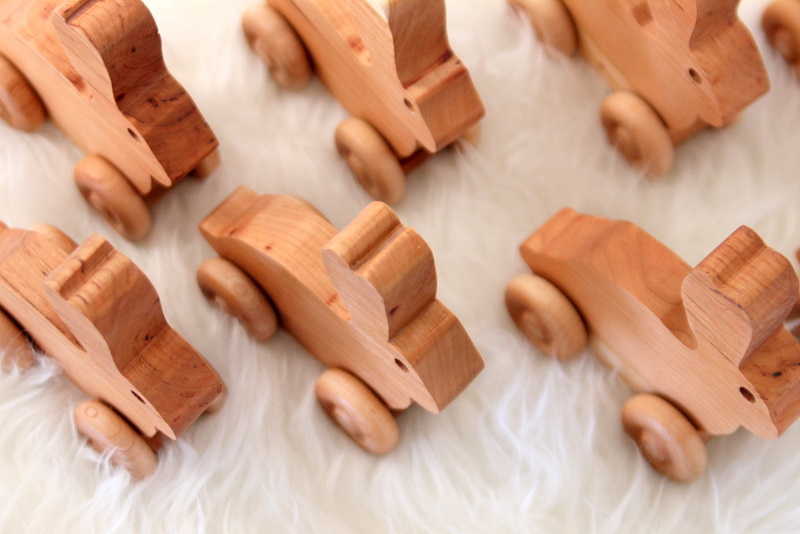 These wooden toys are so cute all alone, but line them up in rows and they make for quite the statement. Even better, you can order these in packs of ten at quite the discount. 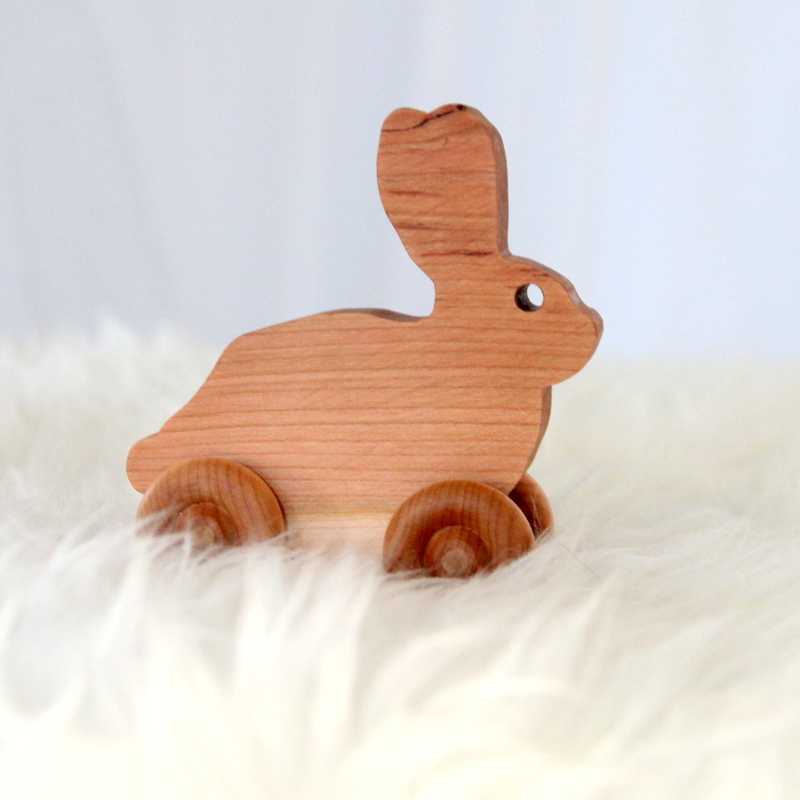 I am already brainstorming wooden toys to order as favors for Burke’s and Piper Jane’s birthday parties this summer! 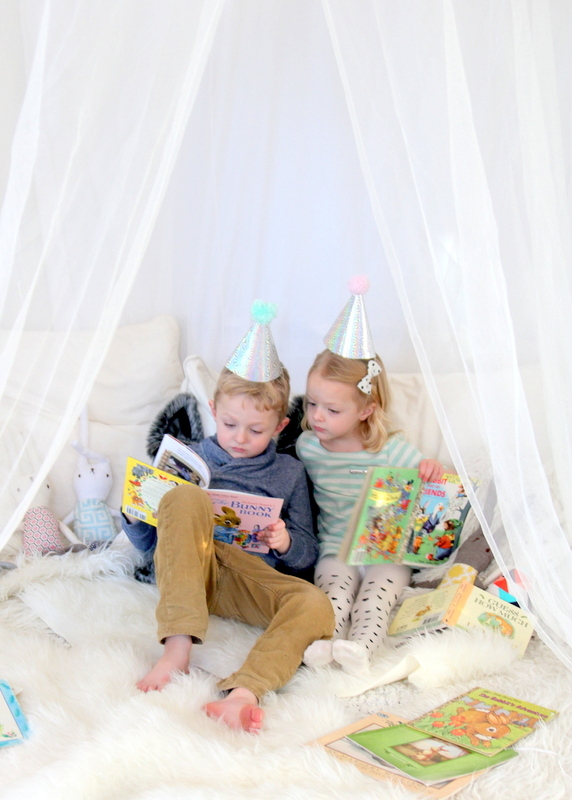 Since my go-to party activity, squirt bottles, were out for this mid-winter soiree, we relied on my other favorite- children’s books that align with the theme of the party. 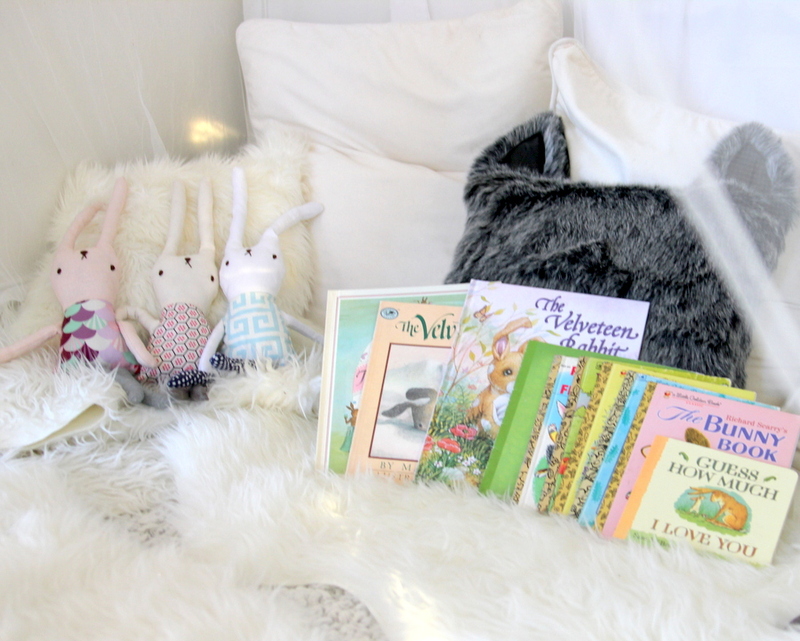 Burke and Pi pulled out every bunny book they could find (including Tawny Scrawny Lion, which, Burke reasoned, has a whole fleet of bunnies in it, just not in the title). Good thing so many Little Golden Books have rabbits as main characters! 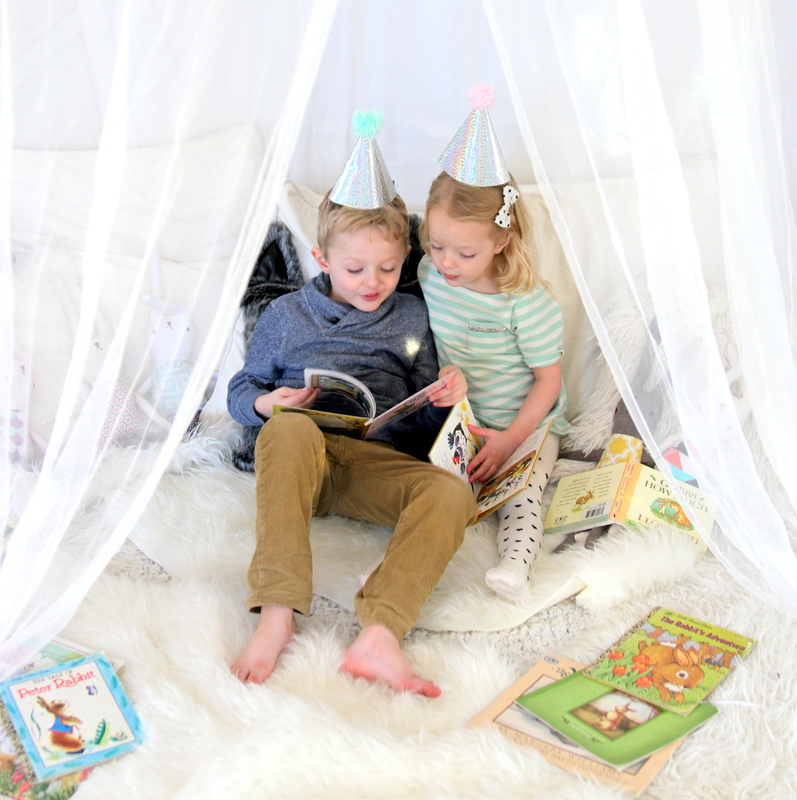 Add a sheer canopy tent, as many sheepskin rugs as we could find from other rooms in the house (we found six!) 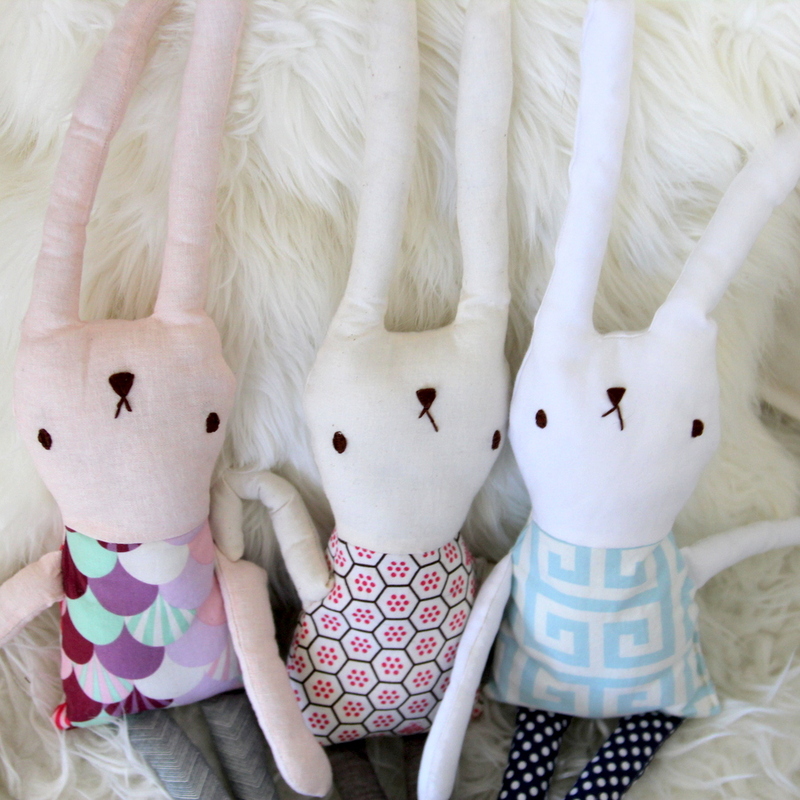 and a pile of fluffy pillows and you have the perfect bunny party activity. 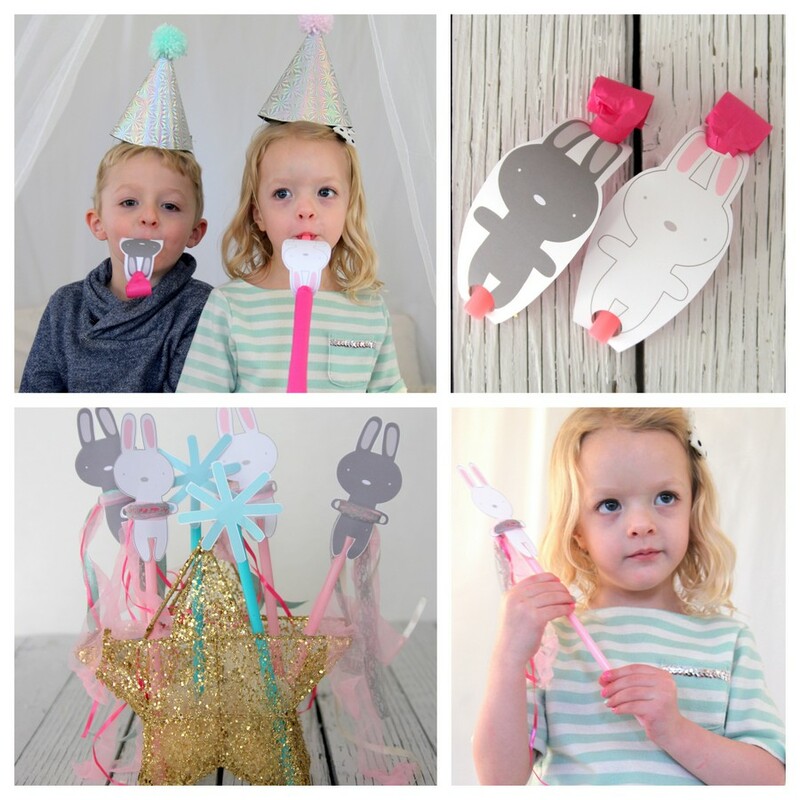 We also made bunny rabbit party blowers, ‘snow bunny wands,’ and ‘jack frost sticks’ (the boy version of the snow bunny wand)- such fun! 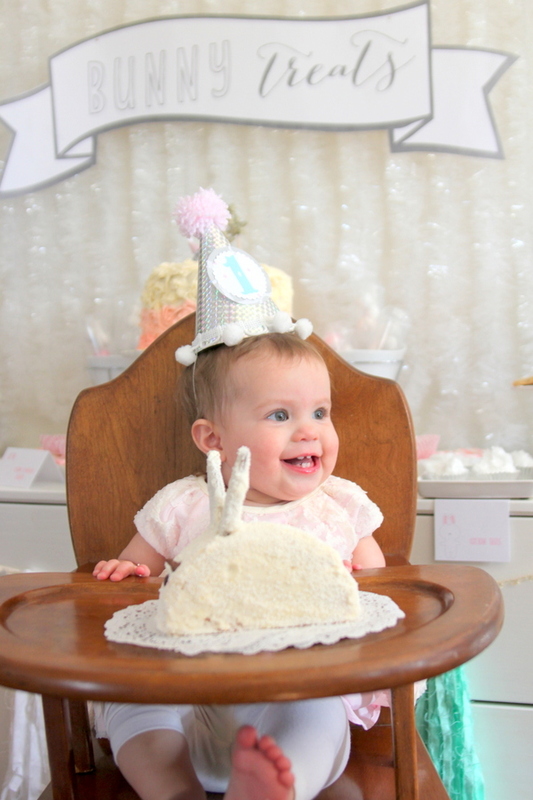 Happy birthday to our favorite one year old in the whole world! LOVE the shot of Josie smiling in the chair. 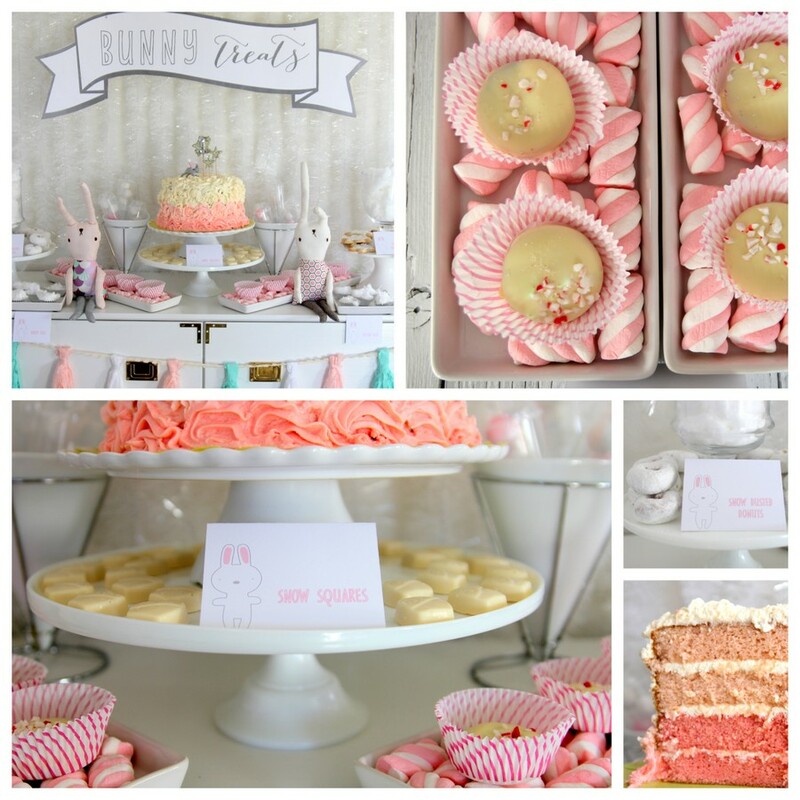 I’m obsessed with the ombre cake and bunny logo. SO cute! 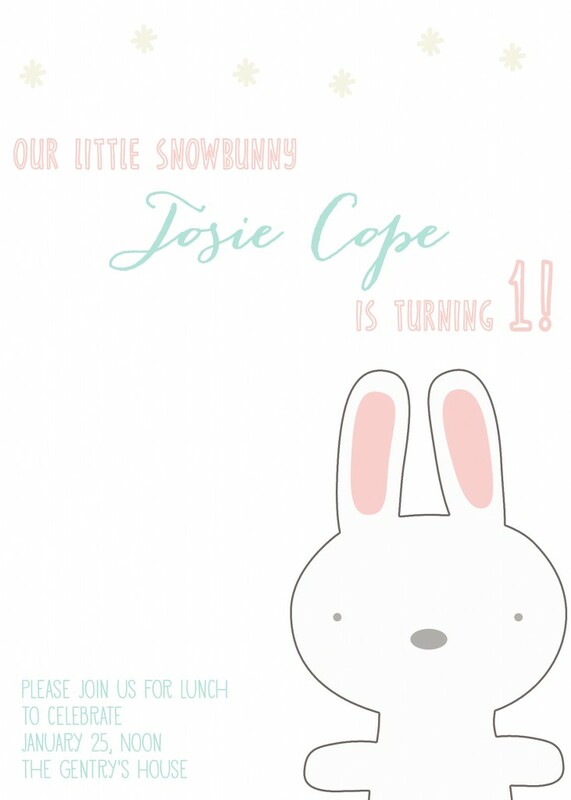 Which font is used for Josie’s name on her invitation? I love love the invites! The bunny is so adorable. Is there any way to order them? Also, love all the little signs for the food/treats. So cute! Thanks Kate! 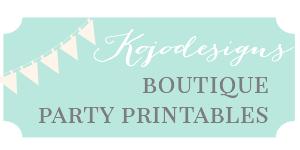 The digital files are in our etsy shop- http://www.kojodesigns.etsy.com (it should be under snow bunny party). Hope that helps! this is adorable! i’m wondering how you prepared the grilled cheese sandwiches and kept them warm for all guests? Thanks mandy! We laid the ingredients out and had a panini press beside the ingredients, so people just made their own sandwiches (the menu board was just for suggestions). Hope that helps! Red Tricycle mentioned your cotton candy ‘snow’ in today’s blog but I don’t see it….. any details? 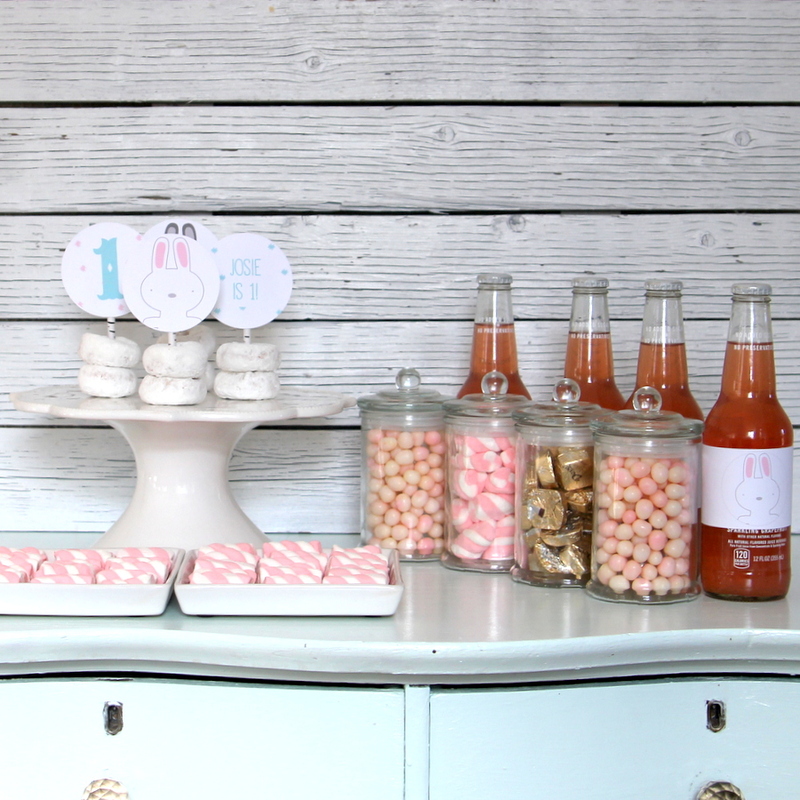 Hey Darcy- the cotton candy ‘snow’ is in the apothecary jars near the powdered donuts…. Hope that helps! I loved the idea of a Grill Cheese bar! and I am thinking of doing it for my 1 year old’s birthday in Dec. Did you have a griddle or sandwich maker at the party? or did you make the sandwiches in advance? Hey Karena! I love it that you are considering a grilled cheese bar. We had a panini press on hand and set out all of the bread and slices of cheese and toppings on the counter and people made their own sandwiches. Hope that helps!